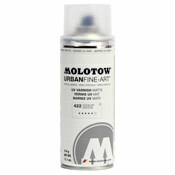 Urban Fine Art Matte VarnishSeal and protect artwork with this Acrylic based UV Varnish. This product protects against color fading as well as dirt, moisture, and chemicals. Safe for indoor and outdoor use. Seal and protect artwork with this Acrylic based UV Varnish. This product protects against color fading as well as dirt, moisture, and chemicals. Safe for indoor and outdoor use.